The following solar heating devices are excellent investments that utilize the sun’s energy to warm your pool and / or spa. They are both affordable and environmentally friendly in several ways such as limiting evaporation (reducing water and chemical usage) and require no energy to produce heat. Solar sun rings are made from 2 sheets of heavyweight UV resistant vinyl. The top clear layer of vinyl holds the insulating air and focuses the sun’s rays on the darker colored lower layer. The lower layer of vinyl absorbs approximately 50% of the sunlight and then converts it to heat. During colder temperatures and after the sun has gone down, the contained warm air serves as an insulating blanket. Water and chemicals will not evaporate through the solar sun rings which means you will ultimately save on both. You should use enough solar sun rings to cover 70% to 80% of your pools surface as your pool requires some direct sunlight and open water to stay healthy. Solar sun rings were designed to be compatible with automatic pool cleaners. In the event the suction hose catches on a ring, the ring will separate from the raft to allow the pool cleaner to continue. The rings are held together with the use of magnets. When you are ready to take them out of the pool, they are easy to remove. 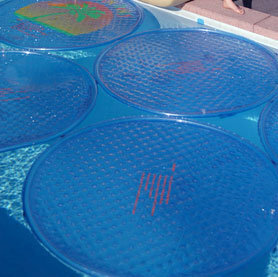 Solar sun rings may be used on both chlorine and salt water pools. They are also easily cleaned with a vinegar solution. Solar blankets act the same as solar sun rings but they are a solid sheet rather than modular rings. There are a few different types of cover materials to choose from: bubble, vinyl and insulated vinyl. Bubble covers resemble bubble packing material but they use a thicker type of plastic and contain UV inhibitors. Vinyl covers are made of heavier materials and tend to have a longer life expectancy. Insulated covers are also an option. They have a layer of flexible insulation layered between two sheets of vinyl. Blankets and covers should only be used during your swim season. In extremely dry conditions such as Arizona, the evaporation rate of your pool will be high. Due to this, it is generally beneficial to have a transparent or bubble cover on during daylight hours. Also, due to the fact that the blanket will cover the entire pool, you may see a 15 degree increase in temperature. Regular covers and blankets will require that you manually pull the cover off and on unless you purchase a reel to assist you. There are also semi-automatic and automatic reel systems available depending on your preference and budget. This should be a consideration when making your solar cover purchase. Solar sun rings or a solar cover are excellent, cost effective alternatives to solar panels! You can find them available online ranging in price from $18-24 per ring or visit your local pool supply store.